This butterfly print was used on other Derby and Cockpit Hill porcelain pieces. This Derby porcelain mug is printed in puce with a half length portrait of the King of Prussia in armour. This print is flanked by prints of a butterfly and and a floral spray. This mug is the only extant example of puce printed Derby porcelain, although Chaffers refers in Marks and Monograms to a Derby cup printed in lilac with the King of Prussia. 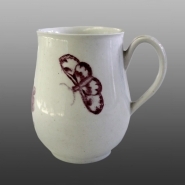 The same print of a butterfly is known in underglaze blue on Derby porcelain and on porcelain attributed to the Cockpit Hill Pothouse. All these pieces would seem to have been printed by Richard Holdship after he left Worcester. He signed an agreement with Duesbury and Heath of Derby to print porcelain for them in 1764. However, this piece could have been printed before this formal agreement was signed as Frederick, King of Prussia was at the height of his popularity in England during the Seven Years War, which ended in 1763.